Great weather which made for a comfortable day birding, but it attracted a lot of walkers and dogs, making birds quite skittish. Overall an interesting day with a few early species but a low number of more expected species. American Golden-Plover (Pluvialis dominica) 1 * Early but expected migrant; several early records of adults and juveniles in southern New England this season. Heard only. Flight call heard twice as it flew over marsh near the lagoon. Flight call a high pitch 'ku-weet' higher pitched than Black-bellied Plover, staying more on the same pitch and lacking the mournful descending quality of BBPL. White-rumped Sandpiper (Calidris fuscicollis) 2 Estimate; Possibly more, only one bird seen at a time but the species was in view several times throughout the morning. Buff-breasted Sandpiper (Calidris subruficollis) 1 * Early - very early uncommon migrant. Quite unexpected species for the day and 300th life bird for a participant on the walk! I first noted the bird as it flew by approx 10-15 ft overhead, one participant first noted the bird fly out of the grassy area about halfway to the lagoon.Small sandpiper with plover-like flight and build and snappy wingbeats. With the naked eye, the bird was very buffy overall with very white underwings. I called the bird out as Buff-breasted Sandpiper to the group and called out the location as I put my binoculars on the bird.I watched the bird briefly through binoculars as it flew in a direct line heading towards the Napatree parking lot area.In binoculars, I noted a thin straight seemingly black bill. The small dark eye stood out in contrast to the buff on the face. The buff color was prominent on the face and chest fading towards the undertail coverts, with somewhat buffy upper parts (suggesting adult though I would like a better look to be certain). The underwing was notably white in contrast to the overall buff of the bird.The bird was seen by at least 8 participants, all of whom commented on how strikingly buffy and unique the bird was. Royal Tern (Thalasseus maximus) 1 * Increasingly common late summer migrant. Large, gull-sized tern with long thin wings and slow wing beats, however not stiff and shallow as Caspian. Despite the size, fairly thin bird lacking barrel shape of Caspian Tern. Thin, heavy orange bill unlike thick stout bill of Caspian. Black cap along back of head with white forehead. In lighting and angle, the rest of the bird appeared all white. 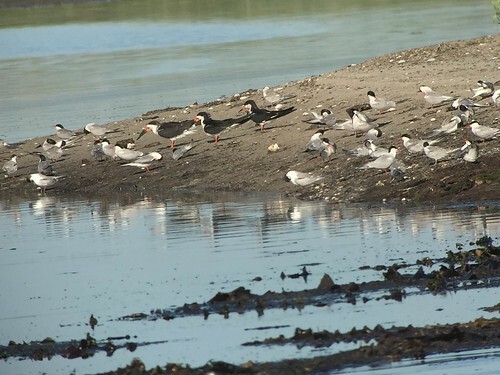 Black Skimmer (Rynchops niger) 3 <a href="https://www.flickr.com/photos/28853318@N08/20357929845/in/dateposted-public/" title="Black Skimmers - Napatree Point, Westerly, RI 8/2/2015"><img src="https://farm1.staticflickr.com/524/20357929845_e325334f68.jpg" alt="Black Skimmers - Napatree Point, Westerly, RI 8/2/2015" /></a>Always great to see skimmers skimming and to actually hear them call!